Destructive CA Wildfire Turning into Firestorm | New! 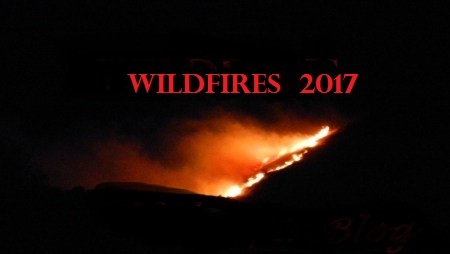 Incident Summary | A wildfire which originated as a small fire started on Saturday, August 5, 2017 around at 1316 PDT in the Wofford Heights area is now turning into a firestorm of 40 acres That may not sound like much but when you have dry fuels, hot conditions and lay witness to the wildfire burning up structures – it is a cause for alarm. Location | The wildfire is burning off of Old State Road in Wofford Heights in Kern County, California. Resources | 3 CAL Fire Strike teams, 5 engines from VCFD, others from Kern County along, handcrews and water tenders with multiple helicopters/air resources are on-scene with more incoming. Size Up | Air resources have laid a retardant line around the fire but the IC says that they are not out of the woods yet and to keep all resources incoming. Wofford Heights, Palisades Estates, Old States and Evans Flat communities are all still being threatened. Media reports of multiple divisions with homes going up in flames but these are unconfirmed reports with no location or how many. Evacuations | Evacuations are in effect for Wofford Heights. More may be coming for additional community. Be ready for any moment gathering important papers, photos, pets, food, supplies and anything else you can fit into your vehicle(s). Social Media | We are using #CalgaryFire and #CAwildfire2017 hashtags.